Respite care is designed to give caregivers a break from caregiving. Respite services can be used when the caregiver is traveling, during holidays, vacations, or whenever there is a need to rest from caregiving responsibilities. Meet your loved one’s individual needs and preferences, including providing for their physical, emotional, and social needs. Provide assistance and support for Life-Skills, Recreational, and Social activities of their choosing. 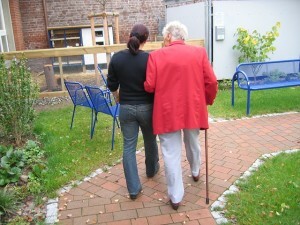 Offer flexible, residential care 24-hours per day that can be arranged from 5 to 30 days. Provide environments where your loved one can sustain their independence and remain active. Recognize and celebrate their past, present, and future contributions. Respite Services at Primrose gives a break and support to caregivers, while the client can stay for a defined period of time and feel safe and as independent as possible. At Primrose we know that aging comfortably in a familiar place with activities and interactions with loved ones is the mode of living all of us would prefer as we age. That said, as individuals age, modifications to residences, work settings, transportation, as well as adjustments in activities must be planned for and implemented, and all of these tasks are typically performed with the help of a caregiver. As so many responsibilities fall to the caregiver, respite care can provide caregivers with a safe place for 24-hour residential care of a loved one on a temporary basis.